The following Pokemon that will be used by Pokemon Trainer Guzma will be chosen at random. Since no two Pokemon of the same species may enter, only one of the two possible Held Item and move sets will be chosen. 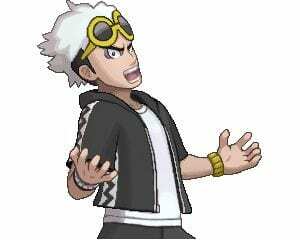 Most of Team Skull Boss Guzma’s pokemon are weak to Rock-Type Moves, however some of those can be taken out with Ground-Type Moves which make Ground-Types with a Rock-Type coverage Move viable. An example of this is Garchomp which also has a good Dragon-Typing enabling it to take neutral damage from Water-Types as compared to if it was purely Ground-Type.Talonflame can also provide offensive pressure against some of Guzma’s Pokemon through its Fire/Flying-Typing which is supported by its type advantage against Bisharp provided that it doesn’t faint from its Sucker Punch. Among Fairy-Types, Tapu Koko is a fast counter to Toxapex and Golisopod since it can use a STAB move to aim for their weak point. In addition, apart from its Type-advantage as a Fairy, it is also Electric which allows it to hamper Honchkrow and Liepard due to its immunity to the sets that carry the crippling move Thunder Wave. Bisharp isn’t as much of a threat too since Tapu Koko only takes neutral damage from Bisharp’s Steel-Type Moves. Tier 85 base speed Pinsir with a Choice Scarf is also threatening as it might outspeed and take out your Pokemon with its move Guillotine. Apart from Pinsir, since it is difficult to defeat Guzma with a Ghost-Type Pokemon as it puts him in a favorable position, it is better to preserve those from battle and use Gale Wings Talonflame on the first slot and have some with the ability Sturdy for contingency instead.